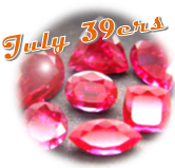 Do you know a July 39er who’s a real “gem”? Of course, all 39ers are gems! Got to thinking about gemstones and how they play an intriguing part in our lives. A popular gift item, over millennia, gems have touched us in many fascinating ways. And even before a list was made “official,” Tiffany & Co. published poems of an “unknown author" in an 1870 pamphlet, lionizing our birthstones. Their July verse: The glowing ruby shall adorn, | Those who in July are born; | Then they'll be exempt and free | From love's doubts and anxiety. But doesn't the day you were born deserve something sparkly? Lovely – but according to Wiki’s lengthy background of gemstones, there are also birth “day” stones allocated by day of the week! Saturday, for instance, shares two: turquoise and diamond. Gems through history have resulted in multiple beauties ruling over each month, astrological sign, and even day of the week you were born.